Have you tried to do this sushi upside down? 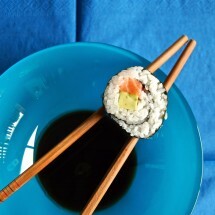 It’s called Uramaki and it’s harder to roll than futomaki because the nori algae is not wrapping the rice here. 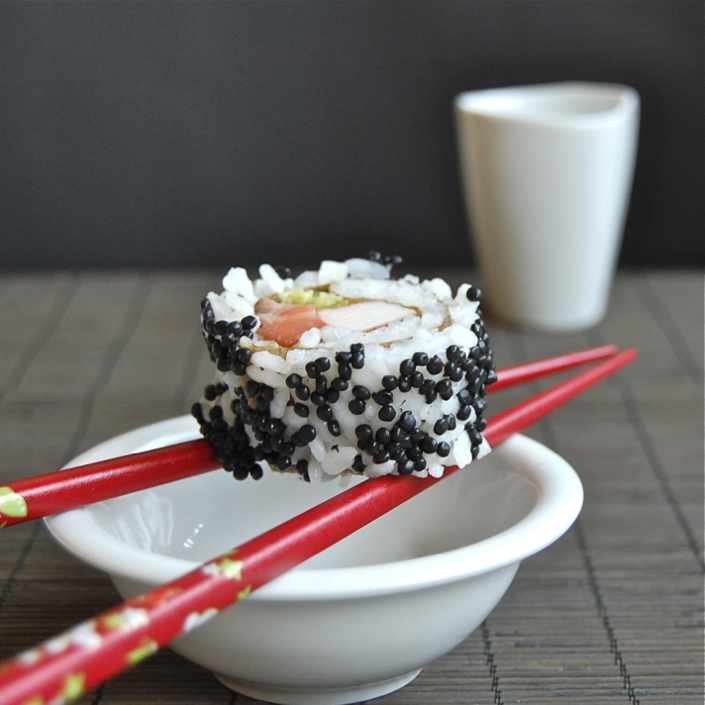 Uramakis show the rice grains on their surface and are coated in fish roe or sesame seeds. It was hard to get the rolls done this time, but since it was my first time with Uramaki, I hope that the second and the third time they will look nicer :D.
At home, we are big fans of Japanese food; my husband loves sashimi (raw fish without rice), my daughter and I prefer futomaki and nigiri and once a month or so I prepare a big tray of coloured and delicious sushi and sashimi. Cooking the rice and making the rolls is so relaxing and the result is so beautiful that preparing Japanese food is like therapy to me! I focus completely on the recipe and since I’m a handy person I enjoy the work involved. Freezing the fresh fish as soon as you buy it is really important, it will free you from hosting these dangerous anisakis (small worms that fish sometimes have). The tuna and salmon don’t loose any of their properties when frozen and you will make sure you kill all anisakis they might have. Ingredients for 4 to 6 servings: 350 grs of Japanese rice, 420 ml of water, 5 tablespoons of rice vinegar, 2 tablespoons of sugar, a pinch of salt. 100 grs of fresh salmon/tuna (or half of each), 1 avocado, some crab meat, 2 cans of flying fish roe or any other similar product (the black one is avruga), nori algae pack and soya sauce. First of all prepare the rice: Wash it under tap water until all the starch is gone, then let it rest for half an hour in a strainer. Prepare a pot with the water and throw the rice in. When it starts boiling count 10 minutes with low heat and the lid on. Then turn heat off and let the lead on for another 10 minutes. Meanwhile prepare the sushizu: Pour the vinegar in a bowl, add the sugar and stir until it disolves, add a bit of salt and reserve. Place all the rice in a big bowl. Carefully add the vinegar to the rice. Move the rice with a spatula or a wooden spoon. Reserve. Extend the bamboo mat over the clean counter and place kitchen plastic film over it, on top put the nori algae. 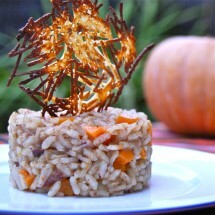 Spread the rice all over (weat your hands so that the rice doesn't get sticky). Turn the algae and the rice upside down (now the rice is facing the plastic film). 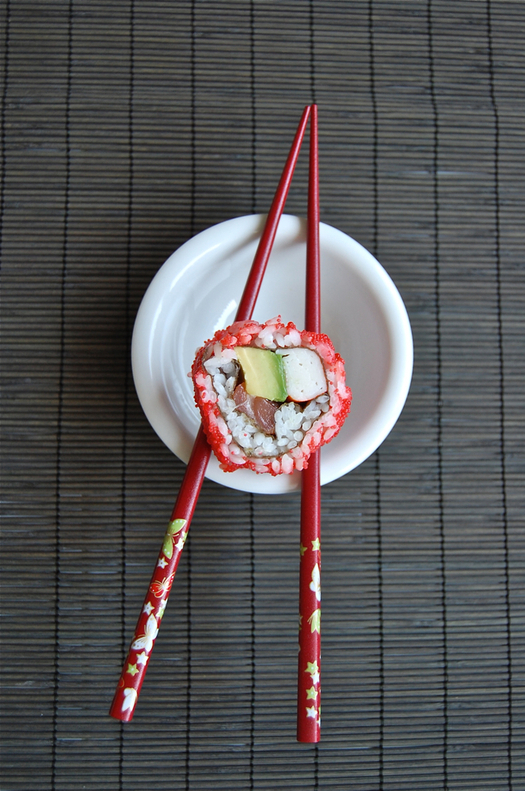 Cut the avocado, salmon, tuna (all you want to use in the roll) and place it more or less in the middle of the algae. Roll it with the help of the bamboo mat, pressing carefully. Take a small tray and pour the roe on top. 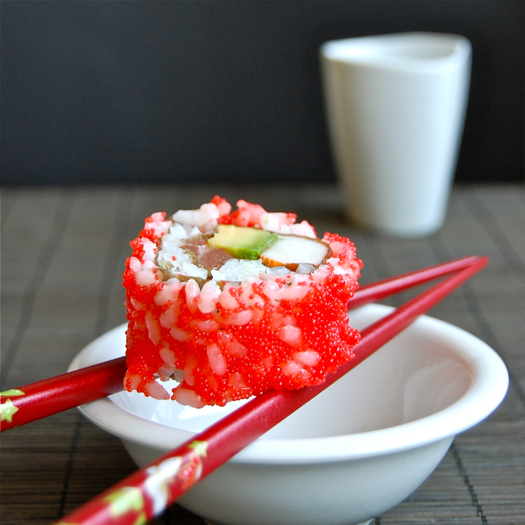 Roll the roll over the roe so that it gets sticked to the rice. Cut in 8 pieces each roll. Get the soya sauce ready and serve. 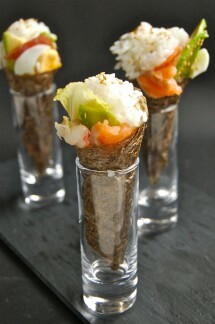 I used to cook a lot of Japanese food, but have never made sushi / sashimi or the others. We love them – You inspire me to learn. And do come visit us when you pass through France this summer – such fun! Nuria, these are impressive! You are to be congratulated for your enthusiasm to make these! Bravo! I am impressed! I think you did a very good job and I love the way you positioned them for the photos. Muy bien hecho! I love making sushi and it has been too long since I have. Yours look absolutely beautiful! 02/25/2012 · 13:14 h by Platanos, Mangoes and Me! When I saw these I immediately put them on my Facebook. They are just to beautiful to eat, but I would not mind having a few. Very well executed and like I said the pictures are perfect. Oh, these look so delicious and so beautifully presented. Wait!? 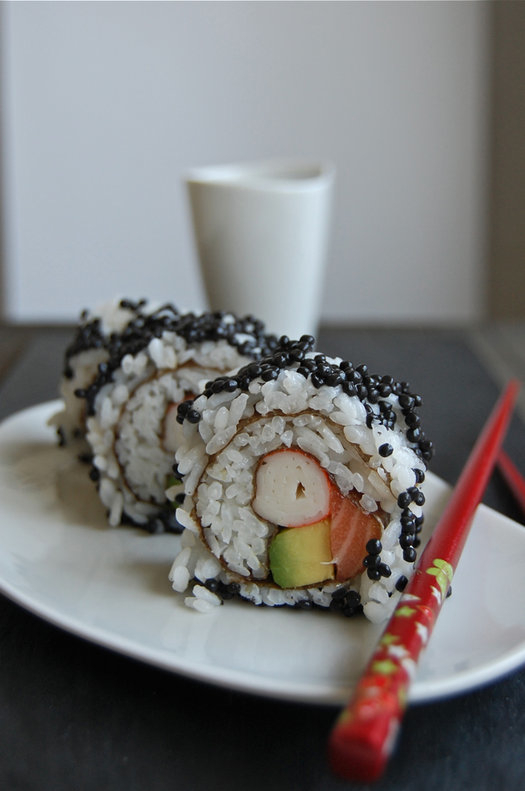 You made that Uramaki? It’s beautiful and I totally would have guessed it was made professionally at a sushi bar. If this was your first time I can’t wait to see the second and third. Rolling my own sushi is one activity I haven’t tried to tackle yet. BTW I tagged you in a post over at Epicurean Enthusiast. Hope you get a chance to zip over and check it out. 07/24/2017 · 14:01 h by Baguettes Chinoises Personnalisées : des Goodies au Top !